It is an incredible honor (and a delight!) to be featured on Lenscratch today! My sincere and special thanks to the ever-incredible Aline Smithson! 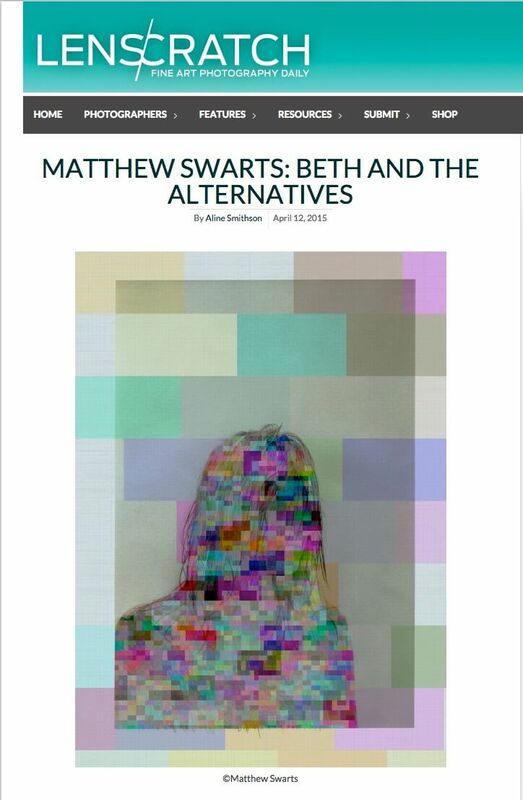 “Matthew Swarts has a current exhibition at the Kopeikin Gallery in Los Angeles that runs through April 18th featuring two projects, Beth and Alternatives. With both projects, Matthew reconsiders photographic memory by altering photographs that have personal resonance. Initially, his series Beth was an intimate portrait exploration of his partner. After the relationship ended, the photographs were evidence of their bond, but he was no longer connected to the images in the same way. Matthew began to alter the images by layering on visual abstractions resulting in a re-imagining of Beth and a new series, The Alternatives. This unusual approach to portraiture considers how the loss of love echoes the loss of visual information, but in the end the memory is still there.